I took a bus from Chalakudy to Athirappilly Waterfall in വാഴച്ചാൽ (Vazhachal) Forest District. This is the road at the entrance to the park. I was impressed by the weekly education programme that the staff offer the staff’s children. The staff teach the children about conservation, ecology, and current events. 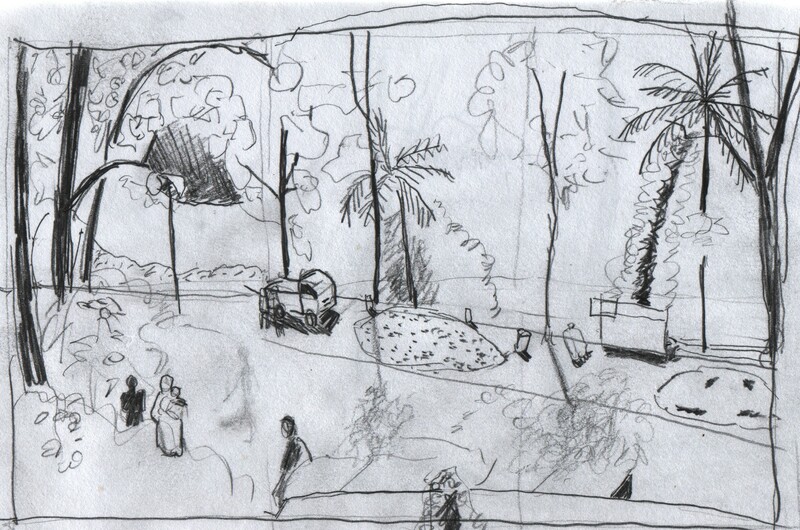 A park worker asked me to demonstrate sketching to the students, and this is my attempt. Some of the students showed me the drawings that they do, and of course I was delighted to see their work. 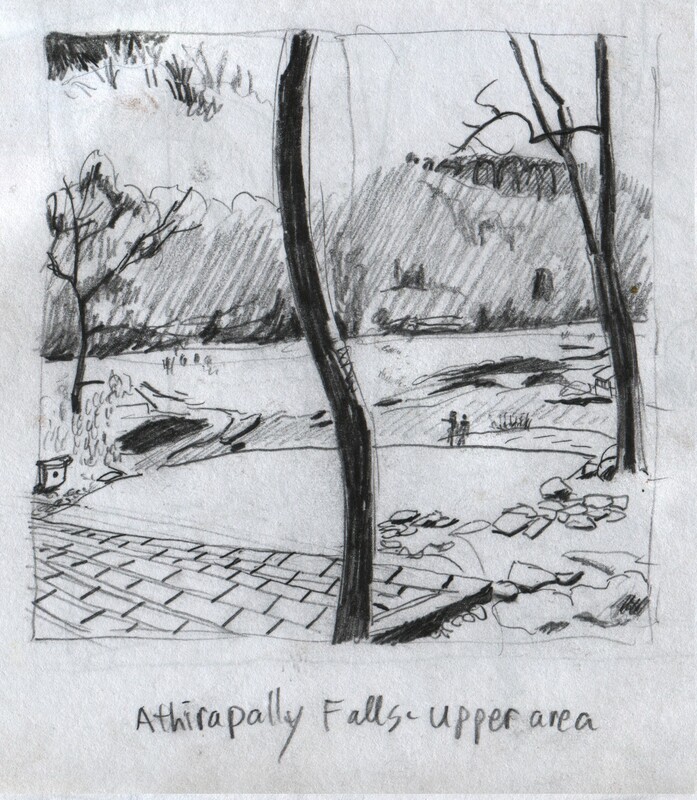 Inside the park, a stone path leads down to the Chalakudy River at Athirappilly Falls. Across the river, a lush, thick forest covers the shore. This waterfall is a favourite tourist destination. 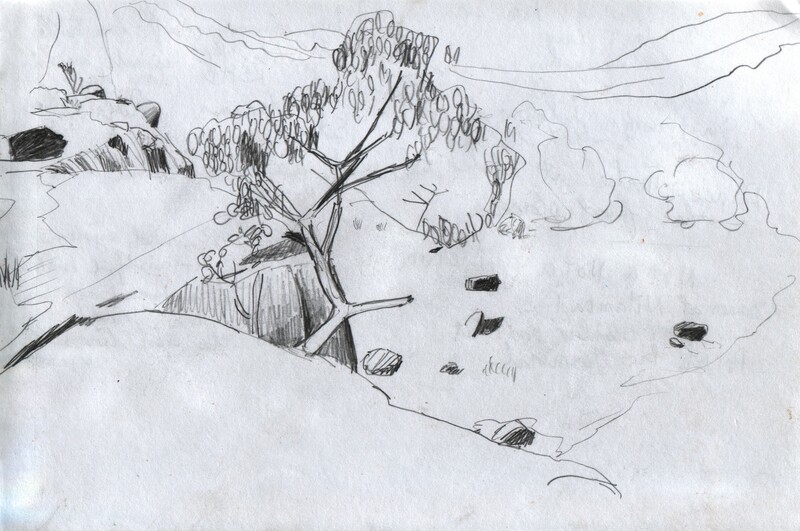 The dry season was beginning, and water levels were low, exposing part of the bedrock river bed. People of all ages enjoyed splashing in the placid water in the side channels. A fence and a watch person in a hut kept people away from the falls itself. This is the Chalakudy River, ചാലക്കുടിപ്പുഴ, that drops over Athirappilly Falls. The declining water level at the beginning of the dry season exposed the bedrock river bed. The public enjoyed splashing in the pools and scrambling about on the islets. I cooled my feet in the river, too. The Malayalam name for the waterfall is അതിരപ്പിള്ളി വെള്ളച്ചാട്ടം (Athirappilly Vellacchattam). Visiting this waterfall was something of a pilgrimage for me. I like the movie Sancharram, and some of the scenes were filmed here. This view looks down over the edge of Athirappilly Waterfall. I hiked to the bottom of the waterfall. At the bottom, the cascading water pulled the air with it. The combination produced a sideways-rushing breeze that carried a dense spray. All the sightseers, me included, got soaked, and I abandoned the idea of trying to sit with my book and sketch the view while being drenched by the fine shower of water. The mood was cheerful: people stood with their friends on the rocks and had their photos snapped with the waterfall in the background, all the while being buffeted by the wet wind. reminds me a bit of David Hockney and Vincent at the same time. 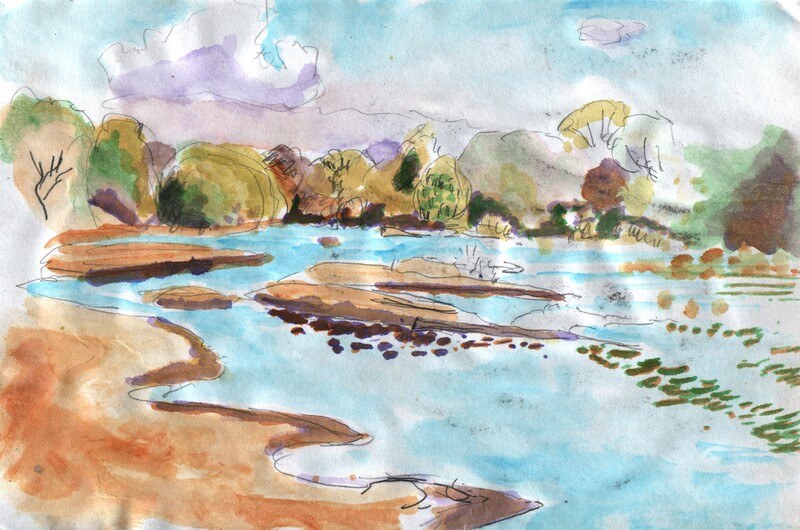 Your water-colour studies of the blocks are great to do…nice stuff. Love your mechanical observations. great work. Thank you, Jim, for your kind comments!